Software Development Laboratories is the home for high quality Hercules emulator software for Windows. Several quality Windows products are offered to make your Hercules experience simpler and much more enjoyable. Click on any of the below images for more detailed information about each individual product. HercGUI is a standard Windows program that makes the Hercules emulator much easier and more enjoyable to use. HercPrt is a remote Hercules printer spooler. CTCI-WIN provides your Hercules guest operating system with a real presence on your Windows host's real local network. AWSBrowse is a simple Windows program used to view the contents of AWS/HET emulated tape files including both Flex fake tapes and Bus-Tech tape files. 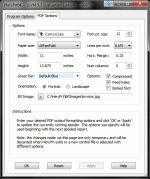 Data can be displayed in either hex or EBCDIC or ASCII format as well as searching, printing, and copying & pasting data to the Windows clipboard. You may download any product for a free trial with no obligation whatsoever and take as long as needed to evaluate it. There is no time limit. All trial copies are fully functional but those products offered for purchase are marked as trial copies and contain watermarks and/or splash screens identifying them as such. Purchased copies do not contain such watermarks. Once you have finished evaluating the product you are expected to then purchase a legal copy if you wish to continue using it. Each offering may be purchased individually at the indicated retail price or several products may be purchased collectively at the same time as a package at substantial discount (approximately 20%). Click on any of the products' Purchase buttons to reach the Buy Now web page where you can see a list of available packages and their corresponding prices. Multiple copies of each offering may also be purchased at an even greater discount. Contact Software Development Laboratories for more information regarding large quantity discounts. Software development Laboratories is also keenly sensitive to those unlucky few to be suffering from severe financial hardship (employment loss, healthcare costs or health issues, etc) and is willing to offer its products to such individuals at whatever cost their current financial situation and/or conscience allows. Contact Software Development Laboratories directly for more information. SoftDevLabs currently uses PayPal as its payment processor. You do not need to have a PayPal account to make a payment. Paypal accepts all major credit cards as well as direct debit of pre-existing PayPal or bank accounts for any of your purchases. Once payment has been made you will then be sent your download URL where you can download your purchased product(s) from. Be sure to include either your mailing address or email address so I can send you your download link. Several of my products are currently in an unfinished state. All of them are fully functional, well tested and come with an installer, but may lack a fully completed Help file. Once the Help file is completed I will upload it so you can then download it free of charge. Future updates will require a new purchase to acquire the new version if it has been longer than one year since your original purchase. Updates released within one year of purchase will be available free of charge.